welcome to thanksgiving dinner, 2010! 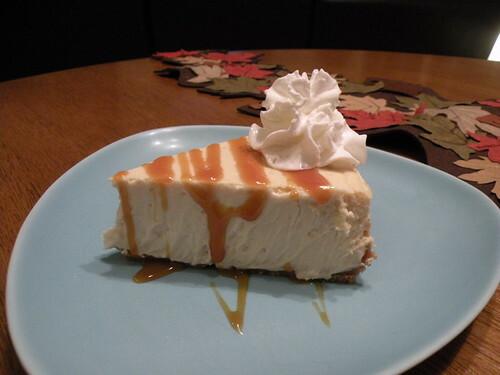 we’re going to start with dessert first… caramel macchiato cheesecake is just like my favorite starbucks drink, but better because it is in cheesecake form! this cheesecake is best served chilled. you might want to make two, because there won’t be any leftovers. the cheesecake is only coffee flavored, so you could add any kind of flavoring on top: chocolate, raspberry, hazelnut… you can flavor it anyway that you’d want to flavor your coffee. preheat oven to 350°. lightly coat a 9″ springform pan with nonstick cooking spray. mix together the graham cracker crumbs, melted butter and 2 tbsp of sugar until well combined. press into the bottom of the prepared springform pan, and 1″ up the sides. bake in preheated oven for 8 min and then remove to cool on a wire rack. reduce oven temp to 325°. begin to boil one medium sized pot of water on the range. this will be for the water bath. i use it when i bake cheesecakes so they do not crack on top. beat the softened cream cheese in a large bowl with an electric mixer until fluffy. gradually add 1 c of sugar, beating until well blended. add eggs one at a time, beating well after each addition. stir in sour cream, espresso and vanilla. pour batter into the baked and cooled crust. prepare a waterbath for your cheesecake by wrapping the base of the cheesecake pan w/ aluminum foil. make sure that it is wrapped so water will not leak into your cheesecake. place cheesecake in a jellyroll pan, pour boiling water in pan. bake cheesecake in oven for 1 hr and 5 min; turn the oven off, partially open the door and allow the cheesecake to rest for 15 min. more. remove from oven, and run a knife around the edges. cool cheesecake on a wire rack to room temperature, then cover the springform pan with plastic wrap, and chill in the refrigerator for 8 hours. YUM!!!!!!!!!! I have to try this one.